Learning about iconography is a great way to discover any deity’s nature, function, and the methods that are applied in their practice. With beauty and power the following excerpts (in quotation marks) from prayers and praises to Gyalchen Dorje Shugden express via his outer appearance his inner intent and wishes. 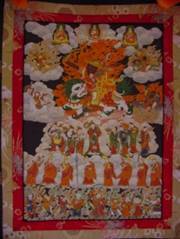 A dark wind-swept wisdom fire emanates from the King Protector and burns up our obstacles and obscurations, arisen from negative karma. In short, it consumes whatever keeps us from the most direct path to enlightenment. The lotus shows his actions are based on great compassion; the sun disc his realization of emptiness. A lion, the fearlessness that arises upon victory over ignorance, attachment and hatred, tramples the enemies, the afflictive emotions arising from self-grasping and self-cherishing. He tramples them into the sun disc, which means he destroys ignorance (self-grasping) by means of realizing emptiness, which frees from self-grasping. The lion is frightening, from our side because ego fears nothing more than confrontation with truth, from his side because wrath is quick and powerful. The same goes for the King Protector: under his wrathful look selfishness and its resulting obstacles crumble and disintegrate. Heart jewel: jewel refers to the legendary wish-fulfilling jewel that can grant whatever we desire. Heart refers innermost essence, and our deepest wish – enlightenment. This shows that Dorje Shugden is the essence of the forces that support and protect those who are serious about dedicating their lives to others by striving for the supreme attainment. Then, like Geshe Rabten said, he will give you his very heart. Monk robes symbolize pure ethical outer conduct (pratimoksha), the domed hat the highest view (vajrayana), Madhyamika, of which Nagarjuna was the first propounder, and which Je Tsongkhapa presented in his teachings with unsurpassed clarity for our present time. The wisdom sword (Manjushri) cuts through the delusions which keep us from seeing reality directly; enemy heart denotes the root of the problem (ignorance), which Dorje Shugden rips out. The other translation, heart of great bliss, also shows his bodhicitta motivation, to refrain from personal peace (nirvana) for the sake of all living beings. He furthermore holds a “taming hook” in his left arm, showing that his power works throughout the three realms of existence, as well a jewel-spouting mongoose that provides material needs. Wearing shoes (tiger skin boots) shows that he appears in the disguise of a worldly god, which means that he is closer to us ordinary beings and easier to propitiate than Kalarupa etc. Finally, his third eye (wisdom eye) in the middle of his forehead perceives directly the totality of relative and absolute reality, past, present and future. 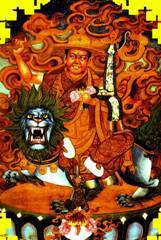 Duldzin Dorje Shugden: consciousness. He gives wisdom and shows the way. Vairochana Shugden: form. He purifies negative karma and obstacles. Ratna Shugden: feeling. He increases what is good. Padma Shugden: discrimination. He brings peace of mind. Karma Shugden: compositional factors. He helps in overcoming delusions and harmful energies. Nine beautiful consorts: elements. They empower tantric practice. Ten monk guides: spheres. They empower monastic code of conduct. “… he who is in essence inseparable from Manjushri Yamantaka in the aspect of the protector of Je Tsong Khapa’s teachings, Mighty Gyalchen Dorje Shugden, dark red in colour with one face and two arms, mouth slightly open in a happy smile, tongue curled, three eyes excited by the force of compassion, rolling, beard and eyebrows blazing like fire.The right hand raises a golden razor sword up to the sky. The left hand holds, at the heart, the heart organ of enemies and obstructors with its root.The left armpit holds a treasure mongoose copiously granting all needs and wishes and a golden hook powerfully summoning the three realms. On his head he wears the domed hat, brilliant with gold of the Tzambu river with silk adornments.He wears the monk’s garments of three flowing robes.On his feet he wears tiger boots. His bodily emanations pervade the universe, his verbal activity gives the teachings, and his mind’s thought is endowed with the ten powers.From his body, which exhibits any aspect, never fixed, is generated a tumultuously wind blown fire of wisdom in the centre of which he sits. From the principal deity’s skandhas, elements, sources, and limbs, a bit of light emanates becoming: in front of the principal deity, mighty Vairochana Shugden, white in colour, smiling wrathfully, holding in his right hand a lance adorned by a mirror and in his left a noose.White silk robe on his body, he wears a golden turban on his head and rides a long trunked elephant.To the right, mighty Ratna Shugden, yellow in colour, holding in his right hand a golden long life vase filled with nectar of deathless life with the ornamented lid of a wish granting tree raised to the sky. Surely you’ll agree the above are self-explanatory.